Here's a photo I hadn't posted from our trip to New Zealand, where I taught and performed in Auckland. 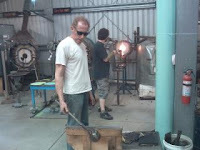 We stopped at a glass blowing factory. The hottest kiln heats the lava to 1200 degrees C or 2192 degrees F.